The X-Men have been fighting each other for a long time. Today, according to a long-delayed X-Men comic originally slated for release in May, it seems like all that drama may have been for the wrong reasons. 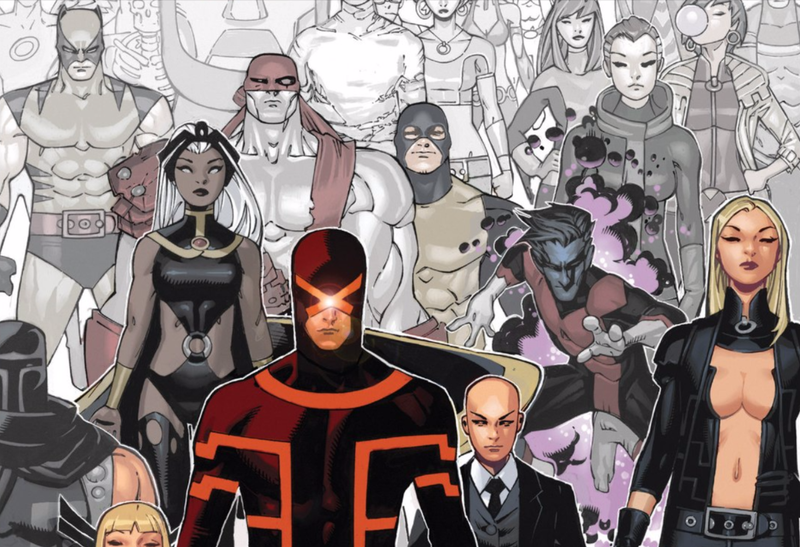 Marvel’s highest-profile mutants have been at war with each other at least since the 2011 “Schism” storyline that highlighted philosophical divisions between Cyclops and Wolverine and resulted in each mutant leading his own X-Men. The 2012 Avengers Vs. X-Men crossover saw Cyclops killing Professor X, while wielding part of the cosmic Phoenix Force. The division deepened. On one side were a group of X-Men led by Wolverine committed to carrying out Xavier’s mission of working towards a peaceful co-existence between mutants and humans. On the other side were a more militant cadre, following Cyclops’ lead to aggressively fight anti-mutant prejudice and oppression all over the world. Into this entered superstar Marvel writer Brian Michael Bendis, who started his run on two major X-Men books in late 2012. The key plot point in Bendis’ X-Men storylines was time travel, specifically the presence of the original five X-Men in the present-day. The younger versions of Cyclops, Jean Grey, Iceman, Angel and Beast were brought forward in time by an older Hank McCoy. The grown-up Beast hoped that the appearance of a teenage Scott Summers would shock the elder Cyclops out of his disturbing behavior. That didn’t work, and the X-factions wound up fighting against each other—and various bad guys—for the better part of three years. In this week’s Uncanny X-Men #600, the hostilities cease. Uncanny X-Men #600 features the team’s blue-furred super-genius getting called on the carpet by a gathering of mutants who feel that his actions have endangered everything they hold dear. This isn’t the first time that the X-Men have been at odds with each other. But all of the latest conflict has felt more dramatically apocalyptic, a lot of it triggered by McCoy’s meddling. The rampant and reckless use of chronospatial displacement was a recurring theme in Bendis’ X-titles, including visits from X-Men from the future who came to the present more than once to try and change history. Perennial leader Cyclops had previously been the most positive optimist in the X-Men but Bendis wrote him as an abrasive, paranoid activist. And the big takeaway here is that Beast—though seemingly still his eruditely pleasant self—has become his polar opposite, a well-intentioned person who has caused great harm to the very people he’s tried to save. but there’s no mega-battle. Just what looks a whole lot like reconciliation. The other parts of this anniversary issue are smaller character-centric vignettes. Young Iceman, who recently acknowledged that he’s gay, talks with his older self about why he never did the same. A long-teased romance starts to bloom among members of the original X-Men, too. As is the case with much of Bendis’s writing, this finale derives its energy from characters reckoning with the choices that they’ve made in their lives. Thematically, the past and present versions of Bobby, Scott and Hank come face-to-face with where they’ve been and where they’re going. And it seems like their journeys will next happen under one banner of mutant unity. While it feels like this issue sets the table for the radically altered state of mutant affairs in Marvel’s autumn All-New, All-Different relaunch, nothing in Uncanny X-Men #600 feels like it justifies a months-long delay. In the All-New, All-Different storylines, homo superior are getting killed off by the same Terrigen Mists that change normal people in superpowered Inhumans. But as this panel from today’s Extraordinary X-Men #1 shows, that’s not all. It makes sense that the X-Men would need to present a united front against impending extinction. However, as part of Marvel’s inner creative circle, Bendis likely knew where the X-Men needed to be months in advance. The ending that he delivers probably won’t make all X-Men readers happy, but it’s at least finally here.